We went for a short hike around Tandle Hill Country Park to work on our map reading skills in preparation for the Pike View Hike. The weather was still cold and we had some snow fall while we were out. Our teams once again did us proud and we retained all the trophies we won last year! 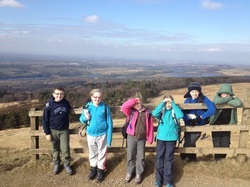 We completed another hike in preparation for the Pike View Hike, this time at Rivington Country Park. The weather was perfect, sunny but not too warm. We met up at Owd Betts for another training hike in preparation for the Pike View Hike. 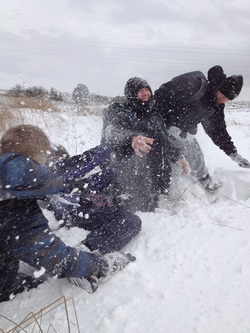 It was absolutely freezing with very strong winds so we had to change our plans. We had intended to head up to the wind turbines but this would not have been safe so instead we stayed on the lower level country lanes, playing in the snow along the way. 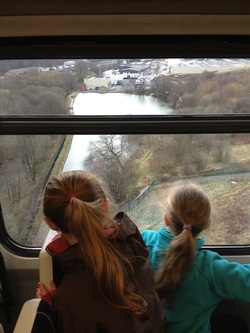 We caught the train from Piccadilly to Hadfield near Glossop for our last training session before the Pike View Hike. It was not too cold but very windy. We covered a few miles and worked on our map reading skills. We also met a huge beetle and loads of frogs! This was our 3rd year competing in the Pike View Hike. We had 2 Cub teams and the Scout team. We camped at Bibbys farm campsite and woke up to heavy frost on the day of the event but by mid morning we were walking in glorious sunshine. navigating this kind of event alone without a Leader to guide them. The following weekend we were out again. This time for our big St George's day weekend celebration. 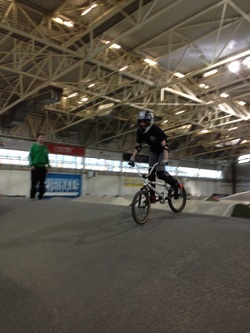 We met up at the National Cycling Centre and had a go on the BMX course which was FANTASTIC! 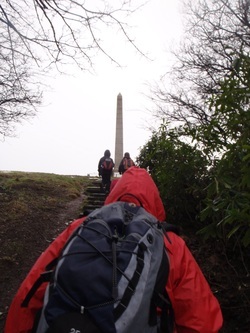 After that we regrouped near Boarshaw Cemetery to do our customary St George's day night hike up to Tandle Hill, then caught the night bus back to District HQ where we spent the night. The next morning we cooked our breakfast on gas stoves before walking up to St Michael's church for the St George's day parade. We were lucky with the weather, it just started to rain as we finished at Middleton Gardens. We took part in the Gaddum Shield event again. This time in addition to the competition there was also a visit from the Chief Scout, Bear Grylls. The competition went really well with some interesting and challenging bases. The Scouts particularly liked the base where they had to gut and cook fish. The real highlight though was when the Chief Scout dropped in, arriving by helicopter then walking around the site speaking to lots of very excited Scouts. We entered a team into a new event. the Bibbys farm Super Patrol Mini Challenge. It involved a team of 6 Scouts competing in various activities such as shooting, climbing, pedal cars, etc over 2 days. It was a wet camp but everyone got stuck in and we won! 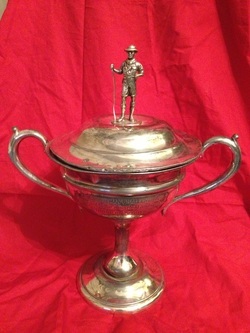 Another trophy we need to try to keep at next year's event! 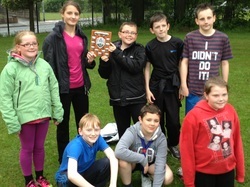 We then went on to win yet another trophy, retaining the District Sports day trophy from the previous event in 2011 (the event in 2012 was cancelled due to persistent bad weather). 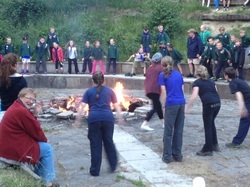 The entire 1st Middleton Group descended upon Ashworth Valley for a Group camp. The Cubs and Beavers stayed indoors and the Scouts camped. The weekend started off with a fantastic campfire. Over the rest of the weekend we took part in air rifle shooting, many Scouts finally completing the requirements for the coveted "master-at-arms" badge, gutted and jointed a rabbit, took part in climbing activities and attempted to play a huge wide game involving both the Cubs and Scouts. Unfortunately the rain got too heavy to complete this but it was still a fantastic camp. We will be back again for another Group camp next year. ​This was our first conker championship. A lot of the Scouts had never played it before but they loved it. It will now be an annual event. 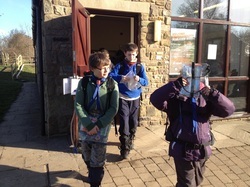 The Cub packs and the Scouts traveled together by coach down to Bradley Wood Scout camp in Yorkshire. We put up tents and the parachute shelter in the dark, finishing just in time before the rain came. 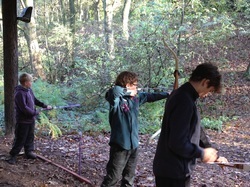 We had a very busy schedule which included high ropes, shooting and archery. On Sunday we took part in a Scouts' own service for remembrance day and held a minute's silence. Many of the Scouts braved the cold weather (it got into minus figures) and slept in hammocks on the Saturday night. We took part in the County Backwoods cooking competition at Ashworth valley. 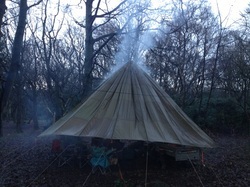 Teams of 6 Scouts had to cook a two course meal and a hot drink. They could only use minimal equipment, tinfoil, 1 dixie for boiling water and a knife per Scout. Everything else they needed had to be made from natural materials. Unfortunately there were only 2 teams in the competition but when the points were added up it was a draw so we were joint winners! We headed to Middlewood camp for a 1 night camp on the shortest night of the year. We set up hammocks, tarps and the group parachute shelter. Yet again we were lucky and managed to get set up before the wind howled and the rain hammered on the shelter. We were nice and dry under the shelter though and sat round the fire until it was time for bed. We have had a busy year. We got out camping as often as we could, although maybe not as often as we'd have liked! 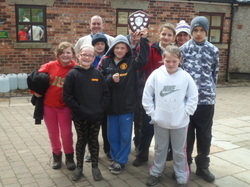 We took part in lots of new activities and won lots of trophies. We have had a Scout accepted onto the Greater Manchester North contingent to Japan for the World Jamboree in 2015 (well done Ryan!). We gained a new Leader (welcome to Jon Gillibrand!) and we have taken on as many Scouts as we can handle as we are now full. The Troop is going from strength to strength. We've got lots more planned for next year though so get ready - it's going to be a busy one!